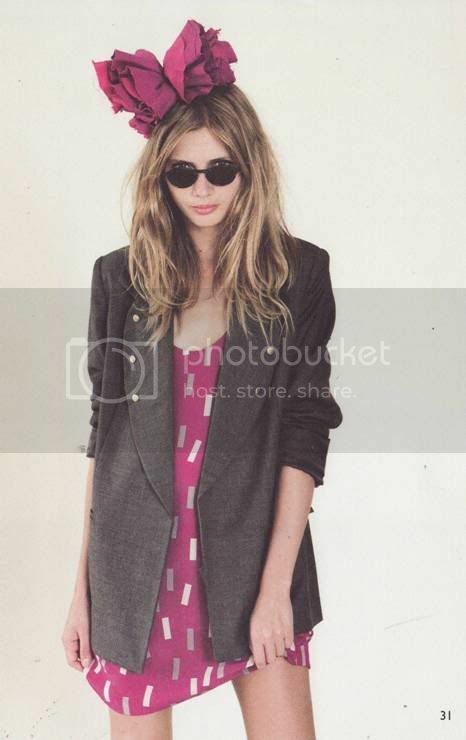 LAUREN MOFFAT LOOKBOOK STYLED BY KATE LANPHEAR: CAN STYLE BE EFFORTLESS? Juno: You're like... the coolest person I've ever met and you don't even have to try. Paulie: I try really hard actually. The Lauren Moffat S/S Lookbook and this quote from Juno in the same blog post.. I swear am not crazy! I am in no way trying to twist these things together so that I can write about my two favorite things fashion and movies. I just happended to have Juno on in the background when I was staring at the effortless perfect chic lookbook styled by Kate Lanphear. It got me thinking is style really so effortless? I know I think about it a lot so I identify with Paulie, I try really hard. I try hard in the sense that I try to work with what I have and create something new out of my closet everyday. Maybe my closet needs a makeover and no doubt items from the Lauren Moffat lookbook would be where to start. Floppy hats, a jean dress, long blazers over flirty dresses and above the kneee skirts make up this stylish lookbook. The title of this is Accidental Tourist and everything about these looks seem accidental. If I didnt know that this was styled, I could almost believe that she rolled out of bed and just pulled something out of her closet. The most attractive part of all these looks is the carefree spirited attitude they emit. That's half the outfit .. your attitude and confidence. My favorite part of all of these looks are the sandals. They go with every outfit and they are so high that I know I would feel like statue in them and how cool would that be? Do you believe that style can be effortless? Wendy you are so passionate about this, I love it. Thanks for the link to your post. Style is a form of expression, and like all art, sometimes some suffering must be done -- ok, maybe not ow-ow-the-the-pain, but it takes time and inspiration for a defined look to develop. But sometimes you get lucky and a whisper from an invisible muse somehow makes everything fall into place, and that can feel effortless! I don't think so... it takes a really talented/well trained stylist or designer to make a look seem effortless! i adore every piece! i believe that style can look effortless, but is never actually effortless if it is great style! does that make any sense??!! as for the whole effortless bit- some people got it, some people don't. I think that often you'll see photos and think "Wow, what effortless style"
But if someone walked past you in the street in that outfit you'd think they'd made an astonishing amount of effort! Even the heels alone translate to "effort" in the real world! I love her lookbook. The first dress is my favorite. I think these pics are great. Love the hats and oversized bows! The denim blazer is calling my name!